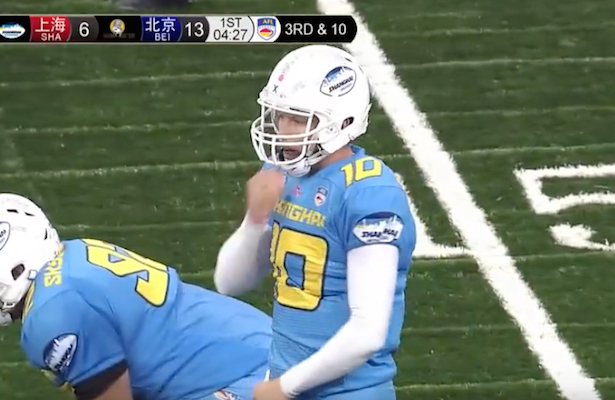 A record setting night by Shane Austin of the Shanghai Skywalkers on Saturday in a win over the Shenzhen Naja has moved the quarterback to the top of the charts when it comes to statistical leaders in the China Arena Football League. The Camarillo, California native set records with 41 attempts and nine touchdown passes while leading his team to a 61 to 48 victory. The total of 109 combined points also established a new league mark. Austin was 24 of 41 for 323 yards and now leads the CAFL in attempts, yards (785), and touchdown passes (10). Five of those touchdown strikes went to teammate Mike Washington who leads the league with 10 TD catches and 339 receiving yards. Washington also is tied for first in the CAFL with Dalian’s Talib Wise with 27 receptions. Shawn Kauleinamuku of Shanghai also had an outstanding game this weekend with 11 catches for 123 yards and four scores to move up to the number four spot in the league in receptions. Another big performer this week was Beijing’s Collin Taylor. The 6’1” 205lb. sure-handed wide out hauled in 10 ball for 124 yards and three scores in the Lions 47-33 win over the Qingdao Clipper which helped to keep the black and gold a perfect 3-0 on the season. The Shanghai vs. Shenzhen game also featured the leagues’ top ground gainer in Naja quarterback Dak Britt. Britt’s 17 carries for 84 yards gives him a total of 183, a 63 yard rushing lead over teammate Arian Ferns who has 120 yards on 22 attempts. Also making a strong showing this week was Dashawn Johnson of the Guangzhou Power. The offensive lineman/fullback gained 38 yards on nine carries in a 40 to 7 win over the Dalian Dragon Kings. Johnson is currently third in rushing with 107 yards on 22 carries.